Michelle is 21, 5ft 5in tall and weighed 15st, a little over 18 months ago. She had gone up to a dress size 20 – something which she was not happy about. She knew she had to take action to bring her weight back down but wanted to make sure she did it in a safe and healthy way. The last thing she wanted to do was embark on a diet whereby as soon as she stopped the diet, the pounds, and more would pile back on straightaway. This is her story. I had always been tall and was never going to be the slimmest of girls, but all throughout my teens, that was ok. It was when I left school after my A-levels and started work that I really started to put on weight. No longer was it just the way my body was shaped – it had become far more of a problem than that. The worst of it was, I didn't know how to stop. Regular nights out drinking did not help and neither did the fact that I was far too busy to cook healthily – preferring instead to eat a microwave meal or frozen pizza. But I knew that I wasn't happy the way I was and I had to do something about it. I also knew I could not just start a drastic diet or an intensive programme of exercise as my body just wouldn't be ready for it. So, instead, i went to see my doctor who talked me through the available options and warned me off any 'fad' diets. 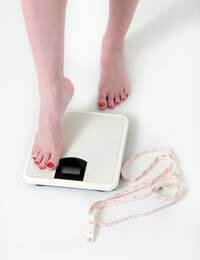 These are the type of diets which may cause you to lose weight quickly to start with but which make you put the weight back on as soon as you stop, which you do, because they are not sustainable. So, I decided on a slimming club – the type where all foods are given points. This is ideal because you can still eat your favourite foods, as long as you are aware of how many points are in them. I also cut out alcohol. The calorie count was too high and the temptation to snack when drinking, too strong. And the last change I made was to start exercising. I had never been one for exercising but I knew I had to start if I wanted to lose weight. I bought a bike and started to cycle to work. Not only, to my surprise, did I find I enjoyed it, but it was actually quicker than driving, thanks to the extensive cycle paths near where I live. The eating plan – not diet – and exercise regime is so easy to manage, I can't imagine ever stopping. Now, 18 months after I started, I look better, feel better, have lost two stone and dropped to a size 14. I'll never be a stick insect – nor would I want to be. But I am proud of what I have achieved, safely and healthily, and I know I'll keep it up.